1. Director-writer-production designer-cinematographer-visual effects supervisor Gareth Edwards makes an impressively audacious debut, especially given his extremely pennywise budget. He hands his industry colleagues and his audience a whole handful of calling cards. I actually think he excels most at the lensing and the convincingly offhanded blend of found locations and incorporated design elementsi.e., the dimensions of his work for which Edwards is reaping the least credit. (By contrast, his scripting is James Cameron-level regrettable, and the visual effects are inconsistent in design and execution, though this is more than forgivable.) Monsters's images pack a charge from noonday sun to humid dawn to barely any light at all, and feels visually spontaneous, three-dimensional, and tense in its framings. Its world is as conceptually compelling as it is convincingly lived-in. And the unquantifiable drift of the crash-landed aliens beyond the parameters the government designates as a discretely bounded "infected zone" seems a much sturdier metaphor for dangerous bureaucratic folly than does the bizarrely meticulous yet completely unworkable tenement-colony of District 9. 2. Monsters not only allows its expository passages to continue twice as long as they ought to, but they encompass at least twice the necessary number of incidents. Insufferable assignments from the boss. Professional disappointment. Pre-wedding heebie-jeebies. Wrecked train. Exploitation of those in crisis. Port closings. Lost passports. Fumbled flirtations. Jealous reactions. "Why are you marrying him?" "You have a kid?" 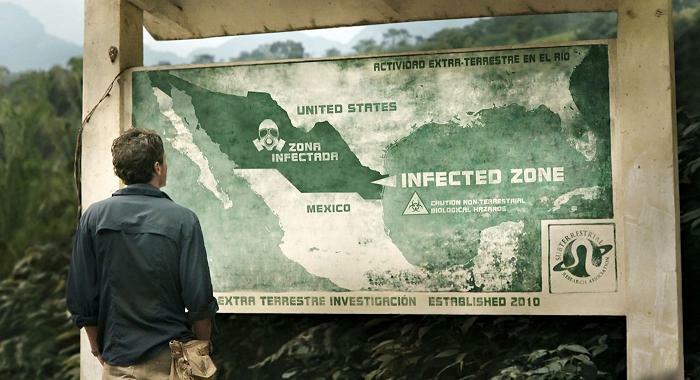 We know the entire time that Monsters just needs to get its leads skulking through the alien-infected wilds of northeastern Mexico. I suspect the impetus is budgetary: Edwards probably lacked the funds and the logistical support to shoot for long on rougher terrain, or to include as many creature F/X sequences as he might have wanted, so he has to pad out the surrounding material. And I'm sure he meant to give his actors more to work with, though the most effective performance by far is Mario Zuniga Benavides's, rendered in only two appearances as an unapologetically cynical ticket vendor. And anyway, the film still mires us for much too long in plotty curlicues involving one and a half dislikable people (she's okay, he's just awful). Worse, it then regroups around their problems at the end. Hasn't Edwards seen Casablanca? Doesn't he know that the problems of two very little people don't amount to a hill of beans in this crazy world? Especially this crazy world? 3. Monsters doesn't extend its fantasy scenario with the broad, idiosyncratically textured, multi-layered brio of District 9 and, inevitably, can't match the pure spectacle menace or technical wizardry of the alien assaults in War of the Worlds. To its credit, though, the movie doesn't blow any of its driving conceits as badly as District 9 does its tattered "faux-documentary" frame, and doesn't get stuck for a deadly span in Tim Robbins's basement. Even if Monsters abstracts its protagonists too much from their ten-times-more-fascinating contexts in the finale, that context remains grievous, unresolved, and mysteriousrather than dopily white-washed and tied-up, as in the Spielberg film. Its highs aren't as high as those of its closest analogues, but its errors aren't as handicapping, either. 4. I was going to add that Monsters doesn't scapegoat or exoticize its Mexican characters the way District 9 does its black Africans, and doesn't seize on glib 9/11 metaphors to buttress spectacular entertainment the way War of the Worlds did. However, it does manage to kill off all of its nonwhite characters and make some very ham-handed jabs at Saying Something about the U.S.'s mythologies of itself and about the quagmire of U.S.-Mexican border-crossing. It's no less obviously and no less stiffly an "America as seen by Europeans" picture as something like Monster's Ball. And as the movie continues, it becomes more annoying that there's no reason for our protagonists to be white (to say nothing of aggressively blonde, in the woman's case). For all the Mexicans who keep protesting they can't afford to leave Mexico, the film ties itself in needless knots to flesh out the motives of its incongruous main characters. Does Monsters somehow not trust us to root for Mexican leads, in a film that is otherwise thoroughly Mexican in casting, locations, and locus of narrative crisis? Would such casting make the last-act revelations appear too dogmatic? I don't think so. Replace Andrew and Samantha with two Mexican characters trying to grab the last train or ferry to join relatives who have already bounded northto certain or uncertain successand you immediately have an emotionally richer and less convoluted narrative line, raising fewer specters of entrenched Anglo-Caucasian bias. 5. Maybe my favorite thing in the movie is how it captures a citizenry that has in many ways resigned themselves not just to the terror but the inconvenience of the alien menace. Watching them haggle over boat tickets and prices, or watching Mexican escorts debate whether it's too late in the day or the season to risk another river-crossing, is to watch people consumed by pressing issues rather than broad implications. They seem exhausted by each other's needs and by their own bad daysnot so much debilitated by the tremendous scale of a global calamity, the likes of which could never have been predicted. It's spooky, the fright, the weariness, but ultimately the acceptance with which people treat world-altering events as impediments to their own plans, or as problems they have to work around while accomplishing other tasks. Not always, but often, Sam and Andrew look more bored and tired by their journey northward than terrified out of their skulls. Yes, this amounts to yet another indulgence of their film-long mopes over things we never care about, but there's also an eerie truth in it. Thompson pulls off such bawdy humor quite well. This time it just did not work for me. Fantastic review on the movie! When I was studying cinematography course, I always ordered my essays and reviews at admission essay writing service cause I can't shape my thoughts into a decent form.